With the explosion of social media, you can easily get sucked into the mind-set of needing to be online everywhere. 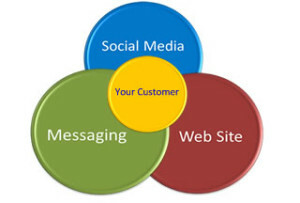 You need to plan your online presence to meet the needs of your customers. How are they most likely to be looking to find you online? Where are they most likely to look ? What is it that you want them to know about you ? One they have found you, how do you want them to stay in touch? Think about how you use, and interact, with the Internet. Your customers are probably just like you. Wikipedia has some great background reading. Check out What is Web2.0.